Kiahuna Plantation - a special place - located on the beach on the sunny south shore of the island of Kauai, the Garden Isle. Kiahuna is reknowned for its beautiful grounds, wonderful beach, and above all else the aloha feeling of its staff. Once you stay at Kiahuna you will want to return. Beach House 45 is our Hawaiian home, we have furnished it with original art and maintain it as we do our home in California. We invite you to share it with us. It is a non-smoking, one bedroom-one bath unit managed and maintained by our on-site rental agent Castle Resorts who gives the unit its top rating. 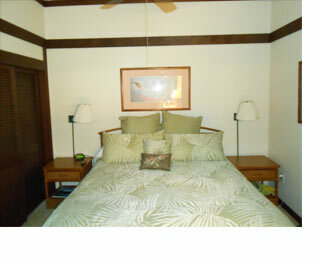 It is located on the ground floor of a six-unit building with a lanai looking out on to the beautiful landscaped lawns and gardens of Kiahuna and its unique plantation style beach houses. 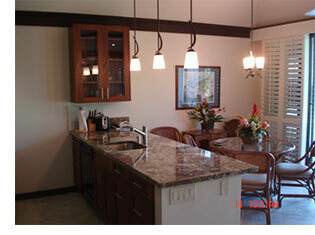 Our Hawaiian home is at ocean level, away from the noise of the road, and a short walk from the beach. 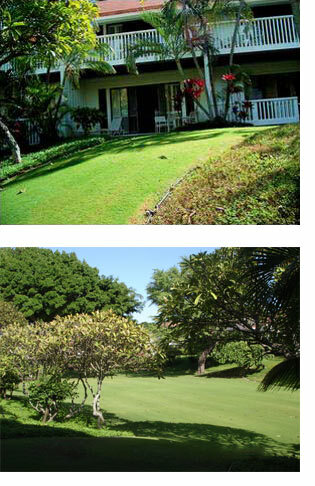 We are members of the Poipu Beach Athletic Club with access to the swimming pool, tennis courts and exercise facility. Plantation Gardens Restaurant on Property with other restaurants located in the shopping center across the Street. Rentals are owner-direct which means you know the unit you are getting. We require a four-day minimum stay. All rentals are subject to the Hawaiian Transient Occupancy Tax (7.25%) and the Hawaiian Gross Receipts Tax (4.16%). We collect and remit the taxes to the state. Please review our Rental Availability Calendar for more information. If our unit is not available when you want it or you want to stay less than 4 days you may use our name with our rental agent and ask for an owner discount. To inquire about our rates contact us at our e-mail address Bmiller450@aol.com or call us at (916) 488-0381. Our Hawaii TA number is TA-070-854-6560-01. We also may be able to assist you with a car rental through our rental agent. We will mail you a one-page contract with the terms. Please sign and return one copy to us with your deposit and retain the other for your records. We make the reservation with the agent and they mail you a confirmation. Approximately 10 days before your arrival send us the balance owing. Arrive at Kiahuna and check in with the rental agent, Castle Resorts (2 buildings away from Beach House 45) to receive keys to the unit and to make any other arrangements you need to make.